Check out upcoming gigs on the Gigs page. Trumpet are a 5 piece Melbourne jazz band led by vocalist David Ruiz playing styles of jazz music from bebop to bossa nova and beyond. Trumpet also delve into blues, funk, soul and 50s rock n roll. Trumpet have performed at private and public events and locations in Melbourne and more including The Langham Hotel - Southbank, The Park Hyatt - Melbourne, Willow Creek Vineyard - Mornington Peninsula and Byron at Byron - Byron Bay. Apart from regular public performances the band is available for private functions and events including birthday parties, Christmas parties, corporate entertainment and weddings in Melbourne and surrounding areas. 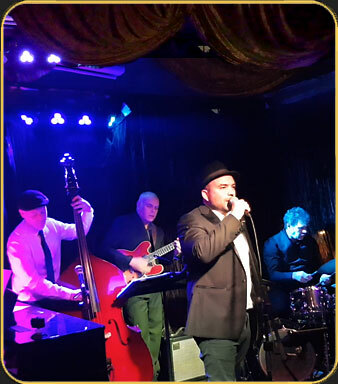 The band is highly experienced in private functions and is the perfect choice for your next Melbourne event, party or wedding. Here is one of the many rave reviews that Trumpet have received. "Trumpet provided the perfect music as the background to our outdoor wedding at Point Nepean on the Mornington Peninsula. Despite challenging weather, they delivered a great mix of jazz, blues and soul tunes which certainly warmed up our guests and were well appreciated by all. A highlight of the day was the band playing At Last" as Philippa walked down the aisle – very emotional. We'd highly recommend them as a cracking wedding band." - Arjang & Philippa Taylor.